Property 7: Bush block and ocean! A winner- trees, wildlife and the sound of the ocean! Property 8: Sandbar Holiday House - Central, River Frontage! Property 25: Pira Place Coonabarabran. Stay 2 nights and get third night free for February. Property 31: Mutley's on Deakin 4 Pets 2! 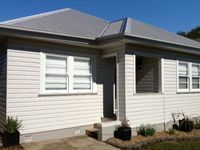 Property 42: Valla's Beach House - Luxury Accomodation. Watch the Whales from your balcony! We stayed in Stars of Doona for a night with friends. The cottage is homely and comfortable. We were welcomed by a herd of kangaroos and our son loved it. John was very helpful and quick to respond to our emails. Our only complaint was that it was a cloudy night and we could not see do star gazing, guess we&rsquo;ll have to go back for that! Perfect for a family catch up! Everything we needed plus more. Excellent communication with the proprietors and all was exactly as expected. We will come again.